Every once in a while its a good idea to review your business and identify areas for improvement. If you are finding your conversion rate could be better, then one of the reasons may be that your offer does not adequately address your prospects wants and needs. Really understanding your ideal prospect is critical to creating services and products that solve their problems and deliver value. Your business may have several distinct customer segments. Each one will have a different set of criteria to satisfy when crafting your service offerings. Selecting out one customer segment and developing a documented avatar or “persona” is a great step towards simplifying your marketing and sales efforts. 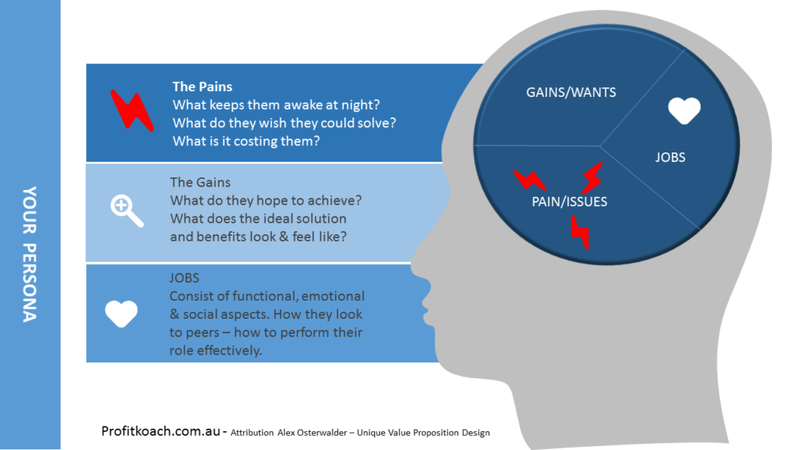 Research in the form of surveys and interviews can identify your prospects issues/frustrations (pains), what they want to improve (gains) and their desire to achieve necessary outcomes (jobs). I am not talking about physical ailments here. Enter into the conversation in your prospects head. The thoughts that occupy a great deal of their time might be about how they wish they could improve their company’s image. The pain may be felt in the low productivity of the staff. 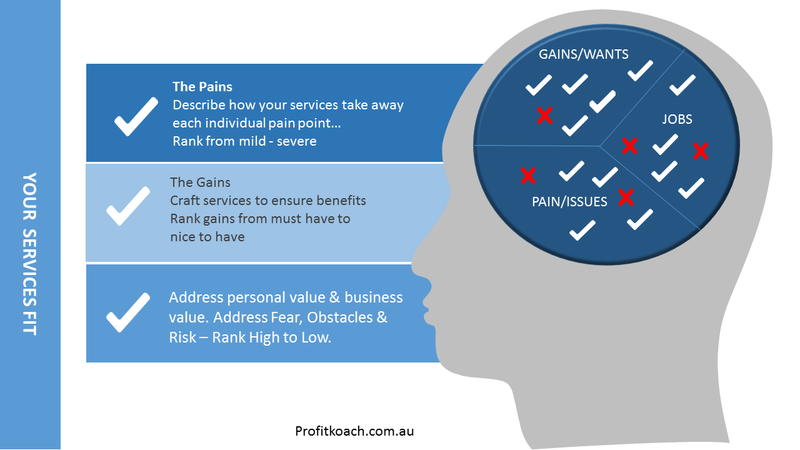 During conversations with existing customers and prospects many signals are given on what is the “pain”. List down their pains, and based on the responses to your interviews, assign a rank of mild, moderate or severe to each problem or frustration they have revealed. These are the tasks and responsibilities of the prospects role. For example, a business owner needs to run their business efficiently and profitably to achieve even some of their “jobs”. There is also a social/personal aspect to the jobs component. The business owner may wish to be seen as astute and professional by his peers and employees. Rank the perceived importance of each job from low to high. You can assign values from 1-5 in defining their importance. To measure desirability of your offer you will measure fit of services and coverage against your avatars criteria. Another dimension of research is to list out your top three competitors and compare your offering to theirs. You may be ahead in some areas or find gaps and deficiencies in others. Compare your services/product against the pains, gains and jobs you have identified for your avatar – what is the fit/coverage? This is a very telling exercise and requires honesty on your part. look at each aspect of your service/s or product and see whether it satisfies the identified criteria. A business owner will have different concern in buying services or products as opposed to a purchasing officer (PO). The personal value in an offering (for a PO) could be that you will perform a presentation for the business owner. This means the PO doesn’t have to do the heavy lifting. It may be your innovative payment plan or post purchase support service that makes the PO look and feel like a legend for presenting your business for consideration. Yes, it is a challenging undertaking to pull all this together. If you are serious about boosting your conversion rate your offerings need to resonate strongly with your prospects. Once you tune your services in this way, your marketing switches from push to pull, and sales are easier to close.